Founded in 1980, Rentex is one of the largest providers of computer & audio visual rental equipment in the nation. Our warehouses contain over 35,000 pieces of high-quality, name-brand rental equipment which consists of: Projectors (up to 40K), Video Cameras, Production Equipment, LCD/LED Displays (including seamless video walls and touch screens), Pro AV Equipment, Computers & Laptops (Macs and PCs), and more all available for rent nationwide by the day, week, or month. We guarantee you the lowest rental rates in the industry and we'll beat any price by up to 10% - Guaranteed! No order is too big, as we routinely handle orders from 1 - 1,000+ pieces of equipment. 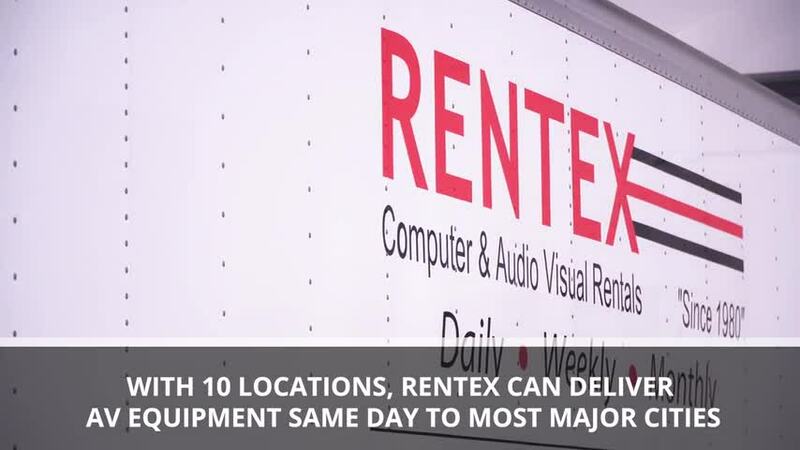 Rentex can deliver to most cities in the US and we provide you with exceptional service and a large selection of computer and audio visual rental equipment. Maintenance and technical support are free during your entire rental and on-site technical support is also available. For the lowest rental rates with outstanding customer service and the highest quality equipment, Rentex is your best choice for audio visual rentals. Work with Rentex Audio Visual & Computer Rentals - Washington D.C.